How many times have you given up on a hunt just when it was starting to get interesting because the Sun had set and it was getting dark? How many times have you wished you had something which would help you see better in the dark? A thermal vision rifle scope is fundamentally a scope that has a compact thermographic camera along with an aiming reticle. Thermal imagery has been used by hunters, soldiers, SWAT, and even military fighter planes and homing devices. Thermal vision lets you clearly see your prey no matter how dark the surrounding is. You can find your prey even if it is hidden behind something. You can also scope out several targets if the environment they’re in is exceptionally dense. How Does Thermal Vision Do This? All animals generate heat which comes off as thermal infrared energy. A thermographic camera can pick up this infrared light (energy) and create a thermographic picture of the environment. This picture is generated by mapping the thermal difference between the prey and the surrounding environmental elements. When scanning the environment, the elements producing maximum heat (like a live animal or a fire) will glow the brightest in the thermal camera, whereas all surroundings appear dark because they’re not producing any heat. How Does A Thermal Camera Differ from a Night Vision Camera? Night vision camera picks up on available light and boosts it to produce an image. It picks up on all available light, including infrared light and runs it through an image processing software to produce an image. However, the problem with these night vision scopes is that there must be some light available for the scope to intensify. In many ways, they suffer from the same problem as the naked eye. If there is absolutely no light visible, you won’t be able to see anything even with night vision lenses. What night vision lenses do, is they simply enhance your ability to see in the dark. 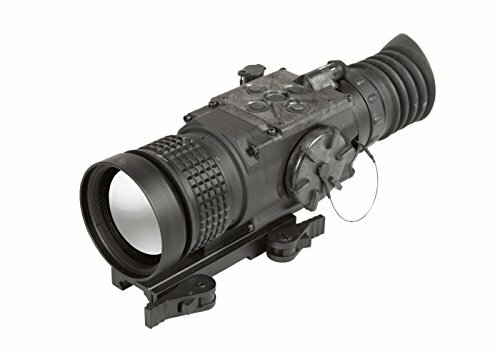 Some night vision equipment has infrared flashlights which they shine on a target. Once they shine their torches and the infrared light falls on the animals, that light gets reflected back to the night vision camera, which picks up the image. It’s essentially a flash but with light that isn’t visible to humans. The problem is that this light might be visible to some animals. Thermal vision cameras don’t use any light at all; they pick up thermal infrared emissions and create a thermal map of the different elements in your field of view. Thus no matter how little or how much light there is, thermal vision faces no problems whatsoever. If you’re buying a new thermal scope, here are the features you need to look for in the specifications column. Unlike a traditional lens, the magnification on your thermal lens is more akin to a digital camera – as in it has both optical zoom and digital zoom. Unless you’re buying a costly model, your optical zoom range will be around the 5X range. If you’re zooming into the digital zoom range, your picture is bound to get blurry. When we say range, we mean the furthest distance from where your camera can pick up infrared light. The longer this distance, the longer the reach of your thermal vision camera. You want a range which is longer than the maximum distance you plan on shooting. Resolution decides the quality of the image on your thermal vision camera. Unlike digital cameras which have resolutions of multiple megapixels, a resolution of 640*480 will be more than sufficient for a thermal camera. This is because all you’ll see on your camera are blobs of color. What’s most important to you is locating your target and discerning its shape from the shape of every other heat signature. Since you don’t need an exact visual of the animal, a small resolution is sufficient. But if it goes too low, the heat maps may get so blurry that you can’t tell one shape from another. On the other hand, if you’re the kind of shooter that wants to hit a particular spot on the animal’s body, you would need a higher resolution to make for a more precise shot. The refresh rate is a measure of how quickly your camera can track movement and can produce new images. The higher the refresh rate, the better it will be able to capture motion in your prey. A higher refresh rate makes a target look much more lifelike. If your targets are in motion, you would definitely want a high refresh rate so you can keep your prey in the crosshairs. If the refresh rate is too slow, by the time the picture on your camera gets updated, the animal would have escaped. A refresh rate of 30 Hz is a little too less; you should ideally look at scopes which have a refresh rate of at least 60 Hz. An often overlooked but critical facet of every thermal vision scope is the battery backup. The last thing you want is for your battery to run out, right when you were about to take your shot. It can be really frustrating to have bad battery backup, which I’m sure you’ve experienced if you’ve ever had a smartphone or digital camera with poor battery life. If you’re out at night with your gun, you would definitely want the battery life to last at least 5 hours. Ideally, it should last right until dawn, but you can extend the battery life by periodically turning it on and off or by employing a power saver mode if there is one. Every hunter favors a particular type of reticle. Some swear by the Mil-Dot reticle which gives you an idea of how far the bullet can travel; some prefer the BDC reticle which can make accurate compensations for bullet drop, while other shooters don’t even use a reticle. It’s a highly personal choice, and you should choose the reticle you’re most comfortable with. If a scope has multiple reticle options, it will have the versatility to tackle a variety of different hunting scenarios. When it comes to thermal scopes, it’s also important to have reticles with colors which contrast those of the heat maps. The lines and markings on the lens should be prominent enough to be clearly visible. Thermal vision scopes on average are much more expensive than a usual scope which does not have a thermographic camera. Because of the sophisticated technology involved, the thermal vision camera itself is quite fragile. One small wire gets displaced inside the scope, and the whole thing will need to be replaced. Thus it makes sense to buy a very durable scope which will stand the test of both time and adverse environmental elements. If you’re going to be running around in the dark, you will end up bumping your rifle into trees and the like. So you need an exceptionally durable scope which can take a battering. Here is our list of the five best thermal scopes available in the market today. First up on our list is this one from Armasight. Developed for military missions, this scope’s vision cuts through rain, snow, fog, and haze to provide perfect visibility through all atmospheric conditions. This scope is designed to be used 24/7 without ever removing it from the rifle. What Makes This Such A Good Choice? The ZEUS camera has several functions and features which can easily be adjusted by simple, intuitive controls. Direct button adjustments and electronic menus do a great job of exploring the huge number of settings options available on the camera. Different settings are grouped together into different layers, which ensures a smooth transition between different modes. This camera has a large number of color modes available:- White Hot, Black Hot, and Rainbow so you can customize the color scheme of your heat maps the way you want. The reticle can also have separate colors like black, white, red and cyan and it has six different patterns available as well, consisting of lines, crosses, and dots. The optical zoom goes up to a maximum of 2.8x / 3.4x (NTSC/PAL) which is decent enough for a mid-range thermal vision scope. And the digital zoom can take it up to a further 4X. What we also really like is the picture quality (resolution) at 800*600. The picture quality can be further boosted with many customizable and specialized image processing tools which make for enhanced contrast and sharpness. There’s also a Smart Scene Optimization feature which highlights out living creatures when the temperature difference between the beast and the surrounding isn’t that great. Another handy feature is that this camera can record video and has a video out cord which makes it very handy for use as a handheld thermal imager. The rechargeable CR123A 3V battery lasts for a good 4 hours and even longer when used sparingly. Just carry around a few extra batteries while going out hunting. As far as accuracy goes, this scope offers windage/elevation adjustments of 0.6 MOA. The maximum windage adjustment is 48 MOA, and the maximum elevation adjustment is 36 MOA, which in our opinion makes for an excellent range. The range of customizable features, image processing tools, and picture quality makes this one from Zeus one of the best thermal scopes out there today. Rest assured, you’ll get your money’s worth with this thermal scope. Next up on our list comes this one named after the Thunder God, Thor. This is the perfect device to shoot down all those pesky hogs and coyotes hiding out in your property. The thermal vision helps you scope out these animals even if they’re hiding behind the densest of bushes or longest of grasses. What we like most about this scope is its inbuilt rangefinder. You don’t need to carry around any additional equipment to calculate the range. The scope will let you know how far away the target is, making for a perfect shot every time. Another great feature which is sure to improve your accuracy is the Ballistic Calculator. Say goodbye to complex reticles and an overload of information. Simply input the environmental data, and let the scope do all your bullet-trajectory calculations for you. The zoom range is 5X to 50X, with a digital zoom of up to 10X which takes the magnification up to that huge number. The zoom system is smooth and seamless, so you never lose your image in your field of view. This is further helped by the refresh rate of 60 Hz which keeps things ultra-realistic. A display resolution of 640*480 keeps your sights crisp and clear. Recoil Activated Video lets you record all your shots, so you can store mementos of your greatest victories and rewatch them later in the living room with your family and friends. It gets stored in an SD card, without any additional USB cables. This scope lets you use a whole battery pack to keep it powered on throughout the night. The battery pack lets you use the device for up to 22 hours without having to change batteries. The technology used in this scope is exceptionally innovative and useful and is bound to make your hunts a whole lot easier. Everything considered it’s a pretty good thermal scope which has all the basics covered and provides excellent value for money. Next up on our list is another product from ATN. It’s a lot like the product reviewed above but with a few key differences. Several variants are available for a diverse array of budgets, with magnification ranges starting from 1.25X – 5X to a maximum range of 7-28X. What Makes This A Scope Worth Buying? The ballistic calculator makes easy work of bullet trajectory calculation by simply asking for weather details like wind, humidity, etc . The rangefinder lets you know exactly how far away your prey is situated. What we think is the best feature of this product is the super sensitive thermal sensor. It provides super clear pictures at high resolutions in the furthest of ranges. The sensitivity ensures the camera can even pick up on the most minute of temperature differences. The sensor has a resolution of 384*288, which might seem a little on the lower side. The 60 Hz refresh rate, however, makes up for it and delivers a very lifelike picture. You can store the video in an SD card or live stream it to your Android/iOS device. Because of all the features mentioned above and it’s steadfast reliability and accuracy, in our book, it’s one of the best thermal scopes available in the market today. Rest assured, you won’t be disappointed if you put your faith in this product. This one is guaranteed to turn you into the ultimate predator, giving you hunting capabilities for a full 24 hours instead of just the daytime. Come hail or high water, this scope will hold its own and give you a great experience. What Makes This Such A Worthy Choice? 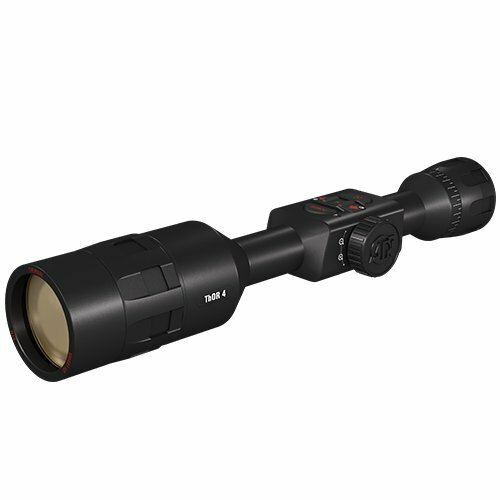 The picture can be magnified up to 8X which makes this a very useful scope for medium range hunting. The zoom is smooth and continuous and is not broken up into different steps. This ensures that the picture doesn’t disappear for even a quarter-second. The integrated rangefinder and trajectory calculator completely eliminates all your trajectory and range guesswork. What’s more, you even get a handheld remote which lets you use your scope as a thermal imager. It also has a host of other hi-tech features like full HD Video Recording, GPS, WiFi connectivity and the previously mentioned Recoil Activated Video. The only thing we were a little disappointed with was the 384×288 resolution. It shouldn’t be a big problem though unless there’s a lot of disturbance in your environment. Apart from the low resolution, it’s hard to find anything lacking in quality in this scope. Highly functional and practical, this is one of the best entry-level thermal scopes available in the market today. Sig Sauer is the oldest weapons manufacturer in Germany and over the years, this name has come to be synonymous with outstanding quality, and utmost reliability. 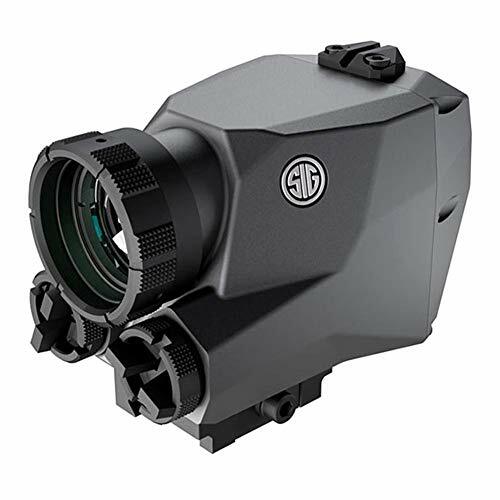 Although this product was entirely made in the USA, it lives up to the same standards of craftsmanship, which have made Sig Sauer the brand of choice for military, government and law enforcement agencies around the world. 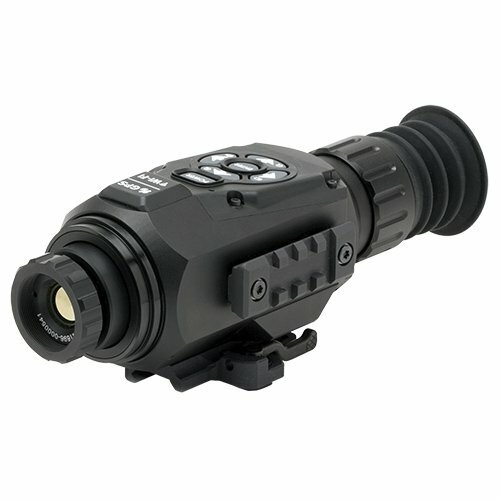 Compact and lightweight, this scope features the latest in thermal imaging sensors. It uses 12 Micron Pixel Size instead of the former 17 Micron Size common on the Commercial Market. This makes for better detection, allowing the scope to detect targets at a thousand yards away, with a targeting range of 300 yards. The LCD has separate modes for day and night along with a variety of color schemes – Hot/Cold along with color palette. The reticle is customizable as well. You have your usual default reticles, and you can even create your own personalized reticle. You can use the camera for a good 8 hours before the battery runs out. This product is made out of steel and is super durable. It has dual supercapacitors to ensure continuous operation even during heavy recoil. It also features IPX-6 waterproofing and abrasion-resistant lens coatings. Sig Sauer makes no compromises when it comes to sturdiness, and this product is no exception. The resolution is 206×156, and the refresh rate is 30 Hz both of which might seem a little on the lower side. However, because this scope is intended for hog hunting, the resolution and refresh rate shouldn’t be too much of a deal breaker. The electric zoom is 1X to 2X, which is okay for close range shooting. 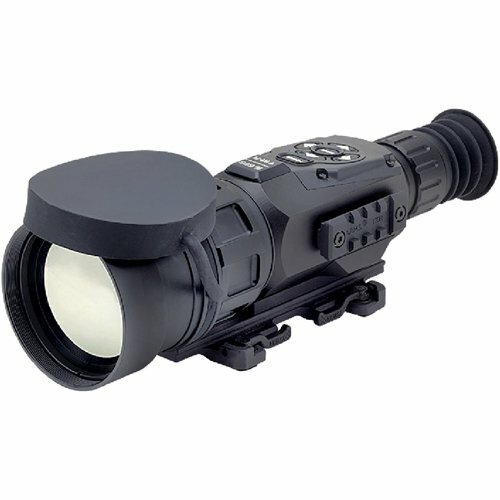 Even though the specs might not seem that impressive, this scope scores top marks in durability and reliability. Made by Sig Sauer, we guarantee this scope performs exactly as advertised and will last you a long, long time. In our opinion, it is the best budget thermal scope out there. Thus ends our review of the best thermal scopes available in the market today. To know what features to look for in the specifications of thermal scopes, refer to our guide above. It should answer most of your questions. Most importantly, remember that thermal scopes are quite complicated pieces of equipment and you should only go for trusted brands like the ones mentioned above. If you are a fan of long-range shooting, you can check our guides on suitable scopes for 1000 yard shots and 338 Lapua Magnum.